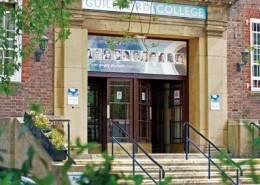 Guildford College Group was founded over 70 years and since that time has grown to be one of the leading providers of further and higher education in the south of England. There are now three Colleges offering training and education as part of the Guildford College Group – Guildford College, Merrist Wood College and Farnham Sixth Form College. The College was assessed on seven curriculum areas and was also praised for obtaining and acting on student opinions and for its social inclusion, pastoral care, equality of opportunity and its strong sense of community. 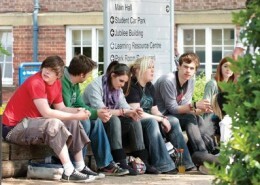 Guildford provides an excellent location for international students in the UK. It is only a short distance from Heathrow and Gatwick International Airports and London is only 40 minutes away by train. Guildford is the county town of Surrey located in the South East of England, as well as the seat for the borough of Guildford and the administrative headquarters of the south east England region. It is situated 27 miles (43 km) south west of London on the A3 road linking the capital to Portsmouth. The town has Saxon roots, and likely owes its location to the existence of a gap in the North Downs where the River Wey is forded by the Harrow Way. Guildford is twinned with Freiburg in Germany. Guildford is home to the University of Surrey, the Academy of Contemporary Music (ACM) and Guildford School of Acting (GSA) so students will be part of a young vibrant community. You can also use Guildford to explore and visit other places of interest including Oxford, Bath, Portsmouth and Brighton; all less than two hours away. Whether you’re into sport, culture, theatre or cinema, shopping or music you can find it all in Guildford. There is a huge range of restaurants, cafes, pubs and bars that cater for everyone. The nine-screen Odeon cinema features the latest in film and for live performances there are two theatres. The nearby Spectrum leisure centre is one of the biggest and best in the country. Shopaholics will love the 300 shops and regular markets and festivals. Culturally, there is a gallery, a museum, an 11th century castle ruin and a cathedral all set in beautiful surroundings. Other tourist attractions include guided tours of Guildford, rowing down the River Wey, swimming in the Lido open air swimming pool and walking in the Surrey Hills – an area of outstanding natural beauty. There truly is something for everyone in Guildford. English as a Foreign Language (EFL) As a British Council Accredited International Centre for the teaching of English as a foreign language, we offer 5 levels of English classes; elementary, pre-intermediate, intermediate, upper intermediate and advanced. Students study a minimum of 15 hours per week but can increase this to 17 or 21 hours per week. 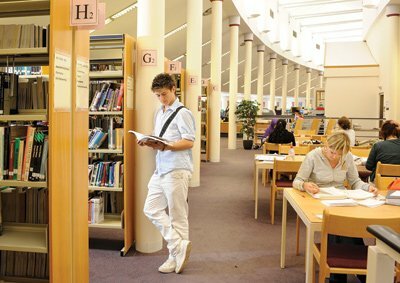 To add value to your time at the Guildford College Group you should consider adding additional hours of Business English, IELTS Preparation, Cambridge Exams or English Plus. Winter School (January and February) Guildford College is proud to introduce our new Winter School for international students wishing to combine a full social activity timetable with 15 hours of General English for a minimum of two weeks. The programme has been specifically designed for those who want to learn General English in a fun environment with close proximity to London’s major attractions. Progression: As this is a nationally recognized qualification, you will be able to apply for a relevant first year of chosen Degree course at any universities. Many students choose to stay with a British family when they first arrive in the UK. This offers a very good opportunity to learn about life in the UK and to practice English at the same time. All our host family accommodation is checked by our Accommodation Officer to ensure that is of a good standard. We also give host families guidelines about the services they provide to ensure all our accommodation is operated to the same standards. Homestay accommodation is normally in single or double rooms (two students in a larger room). We have two kinds of homestay: self-catering if you are happy to make your own food, or homestay accommodation where some food is provided. Self-catering accommodation is cheaper (£80-90 per week) but you have to provide and cook your own food. We also have half-board or full board accommodation. Half-board is where breakfast and an evening meal are provided. Full board also includes lunch. This normally costs between (£90-135 per week). In a host family you will have your own room and use of all essential facilities, including the kitchen and bathroom. You will normally stay with the same host family for the duration of your stay. Many host families keep in touch with students once they have returned home. The host family system works well and we are sure that you will enjoy your time with your family.